By Allison Graves on Friday, August 25th, 2017 at 11:30 a.m.
All summer long, Rick Baker has hammered opponent and current Mayor Rick Kriseman over what he sees as exorbitant spending on the new pier and new police station. In a Tampa Bay Times article on June 14, Baker said: "To me it's all about quality of life. Whether it's dog parks, skate board parks, rec centers ... And the trouble is, if you're $35 million over budget on the Pier and $35 million over budget on a police station, it's very hard to do that stuff." 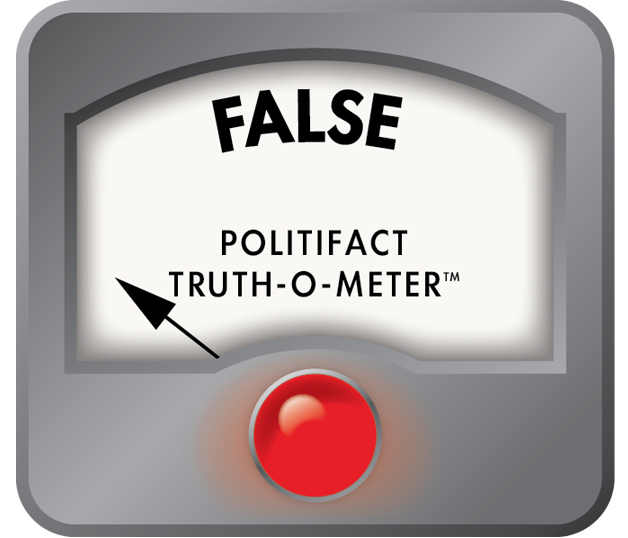 Kriseman, on the other hand, argued the police station is under budget and ahead of schedule — a premature statement that we rated Mostly False. Here, we wanted to test Baker’s claim that the city is over budget on the police station. Plans for a new police station have been in the works since Baker was mayor more than a decade ago. The city’s police building on 1300 First Ave. N. was built in multiple phases, with the first part unveiled in 1951 and the other in 1978. Baker argues the current budget is way more than what was originally determined in 2006, when he was in his second term. The estimate to replace the police station came in at $50 million, according to the Tampa Bay Times. The latest price tag to replace the aging station is $86 million. That’s about $35 million higher than the 2006 estimate. Contrary to Baker’s point, the expected price hike does not prove dramatic cost overruns driven by the current mayor. Baker’s point essentially compares two different projects, holding Kriseman to an estimate that low-balled the expected costs and obviously pre-dated him. 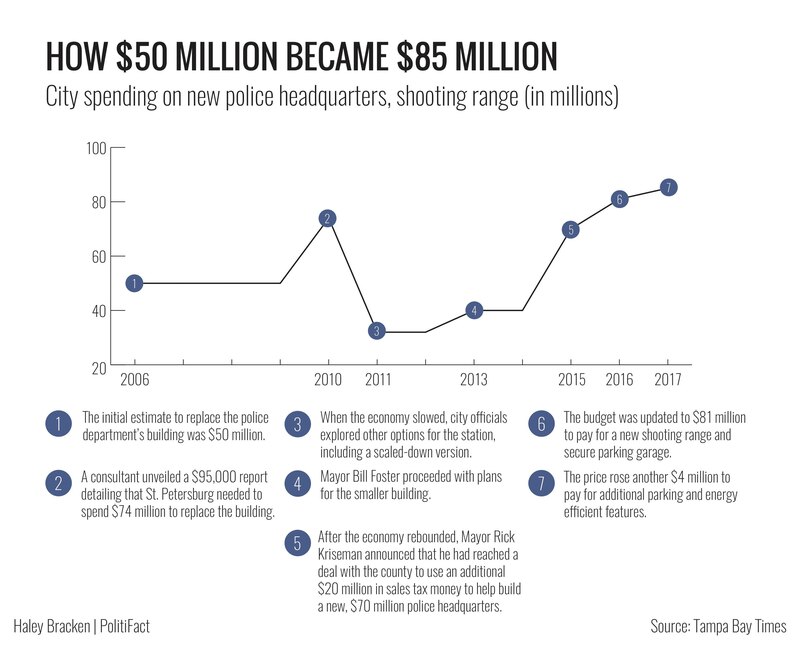 The city knew years before Kriseman became mayor that it would take more than $50 million to replace police headquarters. In 2010, a consultant hired by the city unveiled a report detailing that St. Petersburg needed to spend $74 million to replace its police headquarters. Given the state of the economy, city officials knew the $74 million price tag was too steep. "I don't think we can afford this," said City Council member Karl Nurse in 2010. As the economic downturn set in, the city looked at other options, including building a scaled-down version while making updates to the old facility. However, after the economy picked back up, Kriseman announced in 2015 the city would have enough money to build a new station again for $70 million. After the budget was set at $70 million (a decision approved by the City Council 7-1), additional costs were added for parking, energy efficient features, and a new shooting range, bringing the final budget for new police facilities to $86 million. To Baker, this does not matter. "The bottom line is the budget was $50 million dollars for the police station, anything the department needed, should have been built into that initial $50 million dollar budget, period," said Rick Baker. "The fact that Kriseman is playing budgetary games does not hide the fact that, as documented by the Tampa Bay Times on multiple occasions, he is on a ‘spending binge,’ and is tens of millions of dollars over budget on the police station project." Budget adjustments are not synonymous with being over budget, though. The city is not yet anticipating to spend more than what the council approved. The city says it has spent $4 million towards the construction of the project, which started in late spring. Construction costs eat up the majority of the budget, at $61 million. The rest of the spending is for architecture, planning and other services related to the pre-development of the project. City officials estimated the project will be done in December 2018, and fully operational in spring 2019. Baker is not alone in criticizing the added features cooked into the final project. His staff highlighted how the Tampa Bay Times editorial board criticized Kriseman’s spending on the police station and pier. The editorial does not call the police project over budget. Baker said that the new police headquarters is over budget. Baker considers the budget for the police department to be $50 million, which was the amount that was originally set aside in 2006 when he was mayor. However, before Kriseman took office, a consultant said the city would need $74 million to build a new police headquarters. With the addition of features such as a shooting range and a parking garage, the project’s expected cost is now $86 million. Baker’s insistence that Kriseman should have stuck to a budget developed 11 years ago ignores the changed expectations before Kriseman took office. Moreover, the city is not far enough along on the project to say that it is over budget. So far, there’s no indication that the city is spending more than what the council approved. Baker’s statement is inaccurate. We rate this claim False. Published: Friday, August 25th, 2017 at 11:30 a.m.
Tampa Bay Times, "Get the latest look at the St. Petersburg Police Department's new digs,"